Pritchardia mitiaroana J.Dransf. & Y.Ehrh. Habit with Bob at Pololoei Haiku, Maui, Hawaii (USA). April 11, 2013. Origin and Habitat: Cook Is. (S. & SW. Mitiaro), Tuamotu (Makatea, Niau), French Polynesia. Altitude range: 5-100 metres above sea level. Habitat and ecology: Pritchardia mitiaroana occurs in several small groups and isolated trees scattered, the under story of which is completely covered with a thick layer of dead, fallen leaves of the palms. They are found on raised coral limestone reefs and rocky, sharp, uneven terrain among low scrub, about 3 m tall (frequently with numerous Pandanus with their exceedingly prickly leaf margins). There is little sand, and very little organic matter accumulates between the rock fragments. It is very sharply drained. The mean annual rainfall is about 2,000 mm distributed throughout the year. Temperatures range from 21.5" C to 26.9" C with the coldest months being the driest. Mean relative humidity is about 85%. The mining and accompanying destruction of vegetation probably devastated the populations of P. mitiaroana on the Makatea island and relatively few individuals exist there today. Fortunately, the species is more common on Mitiaro, and it is abundant, with about 1000 reproductive individuals and numerous juvenile plants. Description: Pritchardia mitiaroana is a solitary, rather robust, stocky, fan palm. It is bisexual and flowers for a number of years (pleonanthic) instead of flowering once and dying. Trunk: 4-6(-10) m tall, slightly ventricose, widening to 30-35 cm diam. at 1.5 m above the ground, tappering above, grey brown, obscurely ringed with leaf scars, smooth or with irregular shallow vertical fissures and emitting a hollow, resonating, drum-like sound when sharply struck. Crown: Comprising 16-23 expanded leaves in terminal cluster, the leaves held stiffly. Leaves: Petiole 80-90 cm long clasping the stem, the margins smooth, the surfaces somewhat waxy, glabrous; leaf base fibrous. Lamina bright green, briefly costapalmate, slightly undulate, 100-110 cm long with 60-66 folds in leaves of mature palms, the blade split to ca. 30 cm deep into stiff or slightly drooping segment, the segments ca. 5.5 cm wide. Upper surface glabrous, underneath covered surface abundantly but incompletely covered with in a thin layer of white wax and punctiform dark brown scales. Inflorescences (Panicles): Infrafoliar, somewhat lax, shorter than or about equaling petioles in flower and fruit, branching to 3-4 orders. 10-12 inflorescences and infructescences present at the same time (appearing one after the other during several months, with apparently no flow-ering during the cool season). Peduncle ca. 60 cm long white tomentose. Rachis somewhat zig-zag. Rachillae scarcely crowded, pale yellowish-green, up to 10 cm long, ca. 2 mm diam, glabrous, bearing solitary flowers ca. 4 mm apart. Fruit: Globose, smooth, glabrous, green becoming brownish-black to 7 mm across, borne on the persistent calyx. Style and carpel remains apical. Seed: 5.5 mm across, brown. 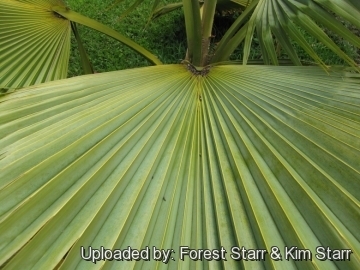 3) Forest & Kim Starr Pritchardia mitiaroana (mitiaro palm). Plants of Hawaii. <http://www.starrenvironmental.com>. Downloaded on 21 August 2014. 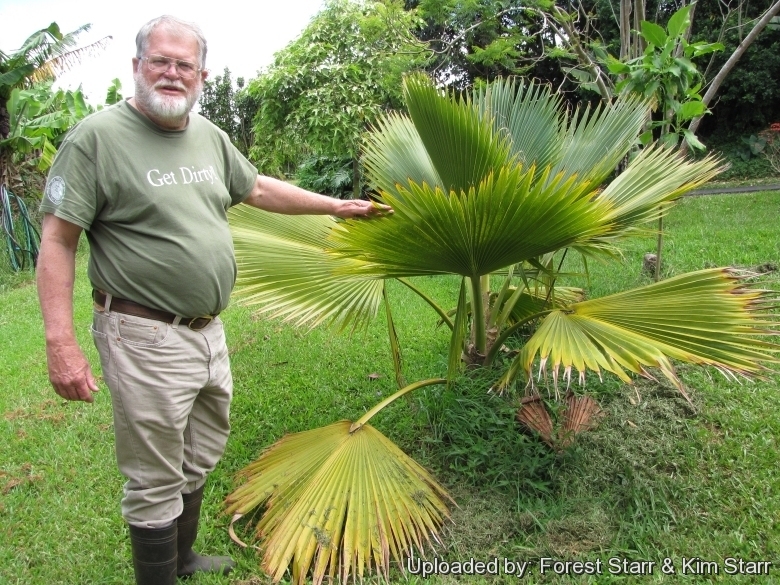 4) David Leaser "Growing Palm Trees in Hawaiʻi and Other Tropical Climates", page 78. Cultivation and Propagation: Pritchardia martii is an easy to grow palm but not often available for the landscape. Pritchardia martii vary in shape. Specimens raised in dry and/or infertile soils tend to be smaller in stature with smaller leaves. Light also affects the plant's form while those grown in full sun are more compact. This palm prefers a sunny, well drained, and moist location. Growth rate: It is a slow growing, short stocky palm. Soil: It likes organic soil, but is adaptable to clay and loam bolth slightly alkaline and acidic. Good drainage is also important. Light: Prefers full sun but will tolerate half day sun. .
Hardiness: It is adapted to tropical and subtropical climates, young plants are more cold sensitive. Maintenance: Remove dead fronds and spent fruiting stalks for a clean landscape appearance. 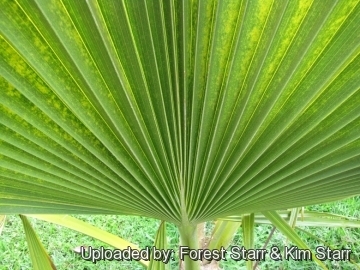 Fronds can be left on the palm to form a skirt for natural settings. Palms recycle nutrients from dead or dying fronds and use them for healthier fronds. Palms only have a set number of new leaves that can sprout and grow per year and removing fronds will not increase that number. If you cut off more than what will grow annually, you could be left with a pretty bare and bald palm. Pest & Disease: Mealybugs and whiteflies underneath the leaves can present problems at times if not kept in check. A generous spray of water can wash them off.